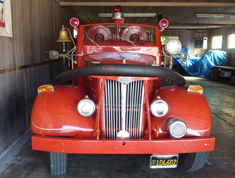 Few would argue that the red fire engine stands as an iconic symbol of firefighting in America. 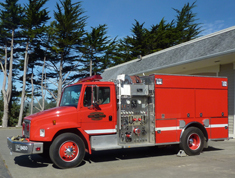 Although there are many engines today of other colors and stripes, the Mendocino Volunteer Fire Department's engines remain the standard red. Each of our engines are specially equipped and detailed for a particular purpose. 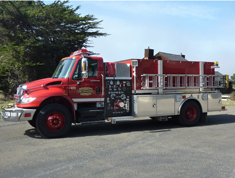 The engines are maintained weekly, and are ready at all times to respond to fire emergencies. This is the main engine used in structure fires. Semi-retired, this 1948 White engine works only on parade days. This is the main engine used in wildland fires. This engine is our first responder and goes to all fire and emergency calls. 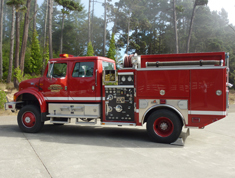 This pumper is used in hazardous conditions such as car accidents. 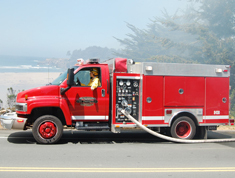 This is the main water tender used in both structure and wildland fires. 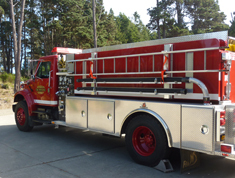 Our engines and fire fighting equipment depend a great deal on community support in the form of donations. Any amount is deeply appreciated.